Ka'ak Bread | Lebanese Purse Bread, is a very popular flatbread found in the streets of Beirut, Lebanon. The bread is often shaped in a tear drop shape with a hole in the center making it look like a purse. Measure the milk and warm it just enough to proof the yeast. Add the sugar and the yeast and mix well. Cover the bowl and let it rise for 10 minutes. At the end of 10 minutes, the mixture should be frothy. If not, the yeast is not active and you will need to start with a new batch of yeast. I made my dough in the stand mixer. Add the flours, salt, oil and the yeast mixture to the bowl of the mixer. Using a dough hook, start mixing the flour until they come together. you might need a little more warm water to make a soft dough. The dough should be quite soft, but not sticky. Knead the dough for about 7 to 8 minutes and then place it in a greased bowl to rise. Cover the bowl and let the dough rise until it doubles in volume. I love using the proof setting in my oven. The dough every time proofs perfectly in the setting and does not take more than an hour. Bring the dough out after the first rise and knead it gently for a minute. Form it into a ball and place it in a greased bowl for the second rise. It took me less than an hour for the second rise. After the second rise, place the dough on a floured surface. Divide it into 4 equal sized ball. Prepare 2 baking sheet lined with parchment paper. Working with one piece of dough, flatten it and roll it into a tear drop shape. Keep the thickness of the dough to about 1/2 inch. My dough was rolled to about 6 inches long. 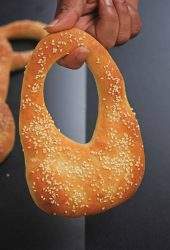 Using a cookie cutter, cut out a ring from the narrow part of the rolled dough. Slightly pull the dough to elongate the shape and place it on the prepared baking sheet. Repeat the same with the rest of the dough, keeping 2 pieces per tray. Cover the trays and let the shaped bread proof for about 30 minutes or until slightly puffy. In the meantime, preheat the oven to 425 F. I used steam to bake the bread. To create steam, I place a aluminum tray half filled with water in the bottom most shelf of the oven when it is preheating. The water also heats up and there is enough steam inside the oven when we are ready to place the bread inside. When the bread is done rising, brush it with egg wash or I just use milk to brush my breads. Sprinkle with sesame seeds. When the oven has preheated, bake one tray at a time for about 10 to 12 minutes, rotating once in between for even baking. The bread should appear golden brown when done.